There are moments when grief is brought to the for front of your heart and smacks you about the head and shoulder daring you to ignore the pain and emptiness it’s bring with it. You try your best to push it down, to lock it in a box until a more appropriate time comes along to handle all the big feels, but grief will not allow it. My heart skips a beat or three, my hands get sweaty and I just know that the tears will come with the next breath. I just know it. This happened to me recently when attending a wedding. The bride was resplendent in her gown of white, her hair swept up supporting a veil edged with lace. She was glowing.Her groom was glowing. They had made it to their wedding day and you could not take your eyes from them, their joy was palbable. Then the dancing started. First the couple and then the Father-of-the-Bride and the Bride. “Fly Me to the Moon” started and the room filled with the couples cherished guests started serenading them and sang along. It was just awesome. I sang and smiled. I smiled and sang. Then I looked at my husband and the expression on his face silenced me. A single tear rolled down his cheek. His eyes were glazed over as if he wasn’t really here with us but far away lost in his own thoughts. It took me a moment to realize what was happening. He and his beautiful daughter would never share this moment together. Jerry would never sing “Fly Me to the Moon” while twirling his sweet Courtney, dressed all in white, on the dance floor. He would never hold her in his arms again. He would never her take her hand and lay it with love into the hand of her future spouse. My husband‘s heart was breaking anew and it would not be the last time. I gently put my head on his shoulder and gently grasped his hand in mine. I stood still and just leaned into the moment with him and silently sent up a prayer to Our Lady for my beloved and his hurting heart. I asked her to gently hold Jerry’s other hand and intercede with her Son Jesus, allowing her Son’s grace and love to flow through him and repair his brokenness. 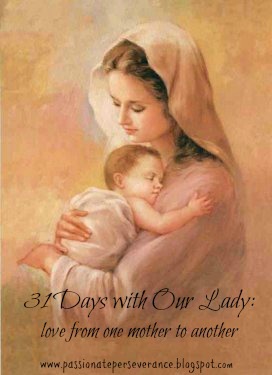 After all, she carried Our Lord in her womb for nine months. She watched him grow up to preach and heal. She had watched as his life slowly left his body. She knew exactly what Jerry was dealing with in that moment and I knew without a doubt that she was right there with us, praying and loving us in the hurt. After the dance was done, the floor exploded with youngsters doing their best to out dance each other. So much fun to watch. Eventually we made or way, hand in hand, to join in the insanity. My guy was smiling again, laughing, singing and dancing. He had weathered the remembering and the pain that brought with it. The remembering sometimes brings joy and sometimes tears but always love for the one we lost. For our sweet girl who now dances with her Beloved Lord day in and day out, we will always love you and we will miss you every single moment of every single day as long as we both draw breath. But one day? One day we will be together again if God so will’s it. Until then we live, taking the good with the bad, the joy with the sorrow, the hard with the easy. Oh the things you endured. The pain your heart must have felt as your son was ripped away from you. The endless humiliations he suffered and all you could do was pray for it to end. No mother ever wishes to lay her child down in death, but you showed us how to survive that very event. You wept and mourned and then you carried on with the Lord’s work, your heart pierced by the sword of grief. Help us Mother Mary. Help those of us who have laid our children down in death to weep and mourn our child and then help lift us up to carry on the Lord’s work. Our job is not yet done. I had one of these moments a few years ago when I showed up at a regular Sunday Mass that was a First Communion Mass. I was so overcome realizing Shelby still had not made her First Holy Communion…and might not ever.